Hospice and Palliative Care of St. Lawrence Valley invites community members to join us for our next quarterly book discussion group on Tuesday March 12th. This quarter’s book selection is The Storied Life of A.J. Fikry by Gabrielle Zevin. A. J. Fikry’s life is not at all what he expected it to be. His wife has died, his bookstore is experiencing the worst sales in its history, and now his prized possession, a rare collection of Poe poems, has been stolen. Slowly he begins isolating himself from all the people of Alice Island and now even the books in his store have stopped holding pleasure for him – these days, A.J. can only see them as a sign of a world that is changing too rapidly. When a mysterious package appears at the bookstore, its unexpected arrival gives Fikry the chance to make his life over – and see everything anew. 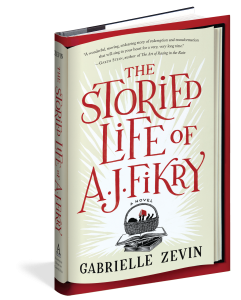 As surprising as it is moving, The Storied Life of A. J. Fikry is an unforgettable tale of transformation and second chances. This is the first fiction novel selection for the group! The book discussion will take place from 5:30 p.m. – 7:00 p.m. at the Hospice Center located on Route 11 in Potsdam. A light dinner will accompany the discussion. The event is free to attend, participants are responsible for obtaining their own copy of the book. Contact Linda Caamaño for more information and to pre-register! Want to support Hospice of St. Lawrence Valley? – Find your copy of The Storied Life of A.J. Fikry on Amazon Smile.